1. What is CPU? What are the functions of CPU? 2. Write the working principles of 8086 microprocessor. CPU in computer can execute instructions on it only. But as the program can be very large, CPU loads the program in the main memory (RAM) and then fetches instructions one by one from the memory to the CPU registers and executes them. 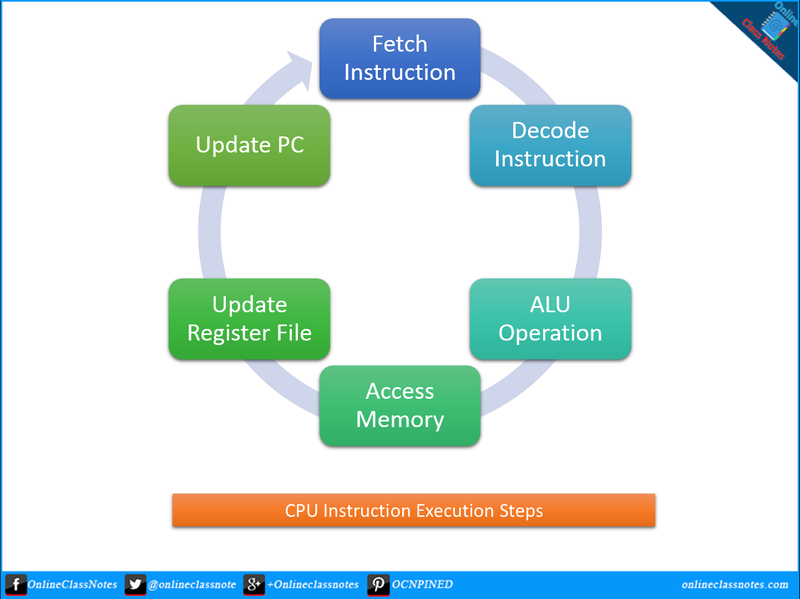 Six steps are involved in execution of an instruction by CPU. However, not all of them are required for all instructions. Execution cycle starts with fetching instruction from main memory. The instruction at the current program counter (PC) will be fetched and will be stored in instruction register (IR). During this cycle the encoded instruction present in the IR (instruction register) is interpreted by the decoder. ALU (Arithmetic Logic Unit) is where two operands in the instruction will be operated on given operator in the instructions. Such as, if the instruction was to add two numbers, then here the addition will happen. ALU take two values and output one, the result of the operation. There are only two kind of instructions that access memory: LOAD and STORE. LOAD copies a value from memory to a register and STORE copies a register value to memory. Any other instruction skips this step. In this step, the output/result of the ALU is written back to the register file to update the register file. The result could also be due to a LOAD from memory. Some instructions don't have results to store. For example, BRANCH and JUMP instructions do not have any results to store.